The Vaio Tap 11 is Sony’s answer to the Microsoft Surface Pro 2. It’s slim - less than 1cm from front to back, which Sony reckons makes it the "world’s thinnest Windows 8 tablet" - and equally at home propped up on the desk like a regular PC, or nestled in the crook of your arm like an oversized slate. There are some serious specs on board too, such as a 1920 x 1080 resolution 11.6-inch screen and Intel Core i5 processor on the standard model to ensure enough power for pretty much anything you'd care to challenge the Tap 11 with. In this new market space of two-in-one tablet meets laptop, has Sony managed to carve out a device that stands head and shoulders above similar models or does it find itself falling down at the same hurdles? The Tap 11 comes kitted out with 64-bit Windows 8 - upgradable to 8.1, or the Pro edition if you wish to fork and along with your biological pointers to tap the touchscreen there’s also a digital stylus, which is powered by a tiny AAAA battery. This is used both for tapping on the screen - each tap works like a mouse click - or drawing and writing directly. It’s a well balanced stylus that's comfortable to hold and very effective. In most instances you can happily do without it, as the touch-capacitive display is sensitive enough to work out what it is you meant to tap even when you have fat fingers and you’re aiming for a small target. If you had any doubts about the wisdom of Microsoft’s tile-based home screen for Windows 8, this accuracy will likely confirm them. What a shame, then, that the keyboard isn’t of the same calibre. We're pleased there's one included, unlike with the Surface, but we'd have much preferred a better considered option. The screen and keyboard are held together by magnets when not in use, with a connection between the two charging the keyboard from the screen’s internal battery, so you don’t need to carry around multiple leads and plugs. The Tap 11 also detects when the two have been docked and puts the computer half of the device to sleep. In an effort not to bulk up the depth of the overall product when the two halves are sandwiched together, Sony has seemingly made the keyboard as shallow as it can. It looks great, but that doesn't negate the fact that it's made it rather flexible - which introduces two pretty serious issues. First, there’s very little travel on the keys, and it doesn’t give sufficient tactile feedback. There’s no definitive click or really much of a sense of going anywhere like there is on alternative - and visually similar but more steeply raked - laptop and Bluetooth keyboards. The overall experience is rather unsatisfying, which is a serious issue when you consider that the keyboard is the primary interface through which you’ll interact with the device. And an £800 device, at that. Second is accuracy. It's an overspill from the first issue really, but we found the Tap 11’s bundled keyboard led to plenty more typos and mistakes than from a more standard keyboard device. This impacted typing rate and quickly became frustrating. We're sure you can learn to accommodate for this difference, but in our time testing out the Tap 11 over a few days it's not something we ever felt comfortable with. A quick tour of the Vaio Tap 11's case reveals a small selection of ports, with a 3.5mm headphone jack to the right, and microHDMI and USB 3.0 socket behind a shield on the left. The power socket is fully exposed below them. Flip open a flap on the top of the screen and you’ll find slots for microSD and a SIM, but there’s no wired Ethernet option, and no optical drive. By default Sony adds on a £50 Ethernet adaptor when you try to buy the device via the Sony Store - it can be removed from the options, but it's something worth keeping in mind. Digging further into the case would reveal a 1.2GHz dual-core Intel i5 processor, 4GB of memory and a 128GB solid-state drive. The graphics are driven by Intel HD 4000 chips and the 1920 x 1080 Triluminos display stretches across 29.4cm or, as its name suggests, 11.6in, with an aspect ratio of 16:9. And it's really rather glorious, although it is large as a tablet device - bigger than the 10.6-inch Surface Pro 2. And that was already large in tablet terms. Power-wise that's plenty to deal with most things. But just like the Surface Pro 2 the Tap 11's moderate graphics aren't going to blow your socks off. It's not a gaming PC, put it that way. There's a paucity of buttons elsewhere on the Tap 11: a volume rocker and power switch backed up by a physical home button on the bezel, which takes you back to the Windows Start screen. That leaves only the discreet Assist button set into the back of the display. It’s easy to miss this, and unfortunately what you get when pressing it isn’t anything like the live video chat help system Amazon rolled out with the Kindle Fire HDX. Instead, it fires up the Vaio Care Desktop help application, which performs various diagnostic tasks to help you identify and fix problems. Sony claims a working life of 8.5 hours from the lithium polymer battery, and although actual performance will depend on the how you’re using the device. We got a full day’s web surfing and work out of it when using apps like Google Drive, which was good enough for us. Sony has resisted the urge to pre-install excessive amounts of proprietary software on the Vaio Tap 11, and what is on board is generally useful. Aside from Vaio Care there’s a movie maker, ArcSoft app for controlling the front and back cameras, and a game in which you throw rotund birds in primary colours until they explode (no, it’s not Angry Birds). Other apps are only really of use within a wider Sony ecosystem and will be of most interest to anyone who already has a Sony television. TV SideView turns it into a rather pricey second screen through which you can find TV programmes and cast and crew listings as you’re watching a show on your TV, while the Vaio Remote Control allows you use it as an even more expensive zapper for both your telly and your other home entertainment gadgets. It will technically work with any infrared device, like an All In One replacement control, but Sony obviously can’t guarantee that it will play nicely with every third-party set-up. There’s an impressive range of TVs already programmed, but if yours isn’t you can take the manual route and point your existing remote at the top edge of the screen and programme the Tap 11 to ape your existing clicker’s functions. It didn’t work with our Hannspree, but your mileage may vary. The speakers are vented through the back of the device and thus fire away from you, but they’re still loud at full volume, and although they won’t rival a couple of decent external units they’d nonetheless be wasted if you restricted them just to system sounds. In our tests they were well up to the task of playing back music videos, with the screen providing excellent image quality to match. Colours were bold and brassy, and definition on HD streams was excellent throughout. As with almost all tablets and laptops, however, the built-in front-facing camera is nowhere near to the same standard as the rather lovely screen can render. The camera captures at 720p and under artificial lighting using energy-saving light bulbs the image had strong sepia tone. The 8-megapixel camera on the rear sensor was far more balanced. There was considerable grain, though, as the internal processing has to ramp up sensitivity in an effort to produce an acceptably-lit image. It did better in bright sunlight, but subjects shot at close quarters demonstrated fairly strong contrasts. It's fairly reasonable in this category - but who's going to buy such a device to use as a camera? The Sony Vaio Tap 11 excels in many areas, while a few other low points rub off some of the appeal. On balance, though, Sony has got it broadly right. A better keyboard would earn it an extra half star, although it’s unlikely that would be possible without making a serious compromise on the highly attractive form factor and, we suspect, the price point was increase too. It may be a little bit big to use as a general purpose tablet, but if you’re happy to cart it around with that purpose in mind then you might be able to mentally shave off the £300 or so that you’ll be saving on a decent Android or iOS slate. 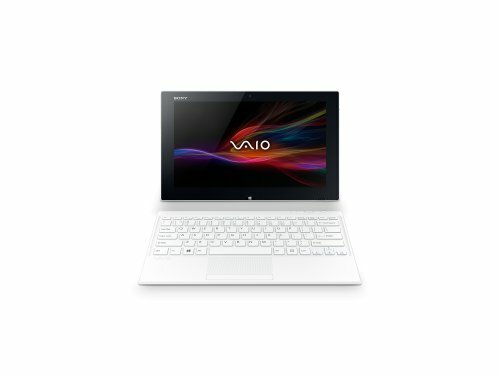 As a laptop replacement the the Vaio's £799 ticket seems fitting, and certainly puts it on par with the Surface Pro 2 - even if it falls into some of the "is it this, is it that?" issues as Microsoft's attempt - thanks to the inclusion of a stylus and keyboard in the price. If only that keyboard was better, eh?